Wills instilled in The Vryll Society something which has become over the ensuing years a key element of what they are, what they’ve become, and of the music they produce. He gave them belief. A belief that hard work and determination will bring them to the place they wanted to reach. “Alan taught us that all you need to conquer the world is a rehearsal room, your instruments, a good work ethic and a positive attitude and you’ll get there. He kind of taught us the rules and the attributes that you need to have to be successful so we’ve just continued on that path” says frontman Mike Ellis. That unit have spent the intervening time creating and honing their own brand new-psych sound, and building up a fanbase with their superlative live shows. Drawing from an eclectic palette of influence from deep funk to Krautrock, electronica and prog, they’ve created a heady, intoxicating, pin sharp, and tightly wound mellifluous groove, washed over with cyclical motifs, acres of effects laden guitar hooks, and shimmering, textural technicolour soundscapes. It is at once blissful, dizzying and madly infectious. It’s that eclecticism, that kaleidoscopic swirl of influences which brings together hip hop flavours, with the prog stylings of names such as Aphrodite’s Child and The Verve – pre Urban Hymns – when the drugs were still working. 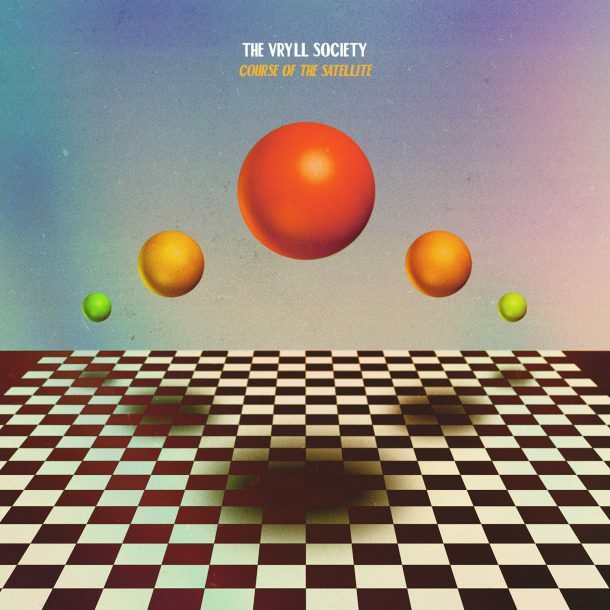 The dynamic leaps and folds through all these influences is where you find The Vryll Society’s own brand perfect pop. Its all there in the loops, in the hooks, the drive and the vibe of this unique band. But this isn’t frippery, these aren’t throwaway cheap thrills for our disposable times. No, this is heavier. This is music too feed your head. The songs that fill the delicious grooves of Course Of The Satellite weren’t so much written as devised or developed, brought together organically over months in the band’s underground lair, or over weeks in Liverpool’s Parr Street Studios. Working closely with producers, Wills’ right hand man and Deltasonic brother-in-arms Joe Fearon and Tom Longworth, the album took shape organically, biding its time and finding its way. The result is a work of impressive confidence and stature. It’s a record that believes in itself, and for all the right reasons. This is an effortlessly cool album, the sort of record that makes friends easily. The world is ready, willing and more than able to take The Vryll Society even deeper to their heart. The path Alan Wills showed them awaits. It’s a path that leads to greatness.